Arcadis are widely recognized for providing Expert Witness services in relation to International Arbitration. Our experience spans every sector within the Construction, Engineering, Oil, Gas, Marine and Petrochemical industries. Our Contract Solutions team consists of highly qualified quantum, delay and technical experts, with wide ranging and complementary skills and experience. We are frequently engaged to provide written and oral evidence within International Arbitrations, and we have a demonstrable track record of doing so in several jurisdictions. In a network of offices around the globe, we employ leading industry recognized expert witnesses and can quickly mobilise expert teams to meet the immediate needs of our clients, regardless of the project location. Our leaders continuously evaluate and respond to the changing needs of our clients by providing independent and targeted advice. 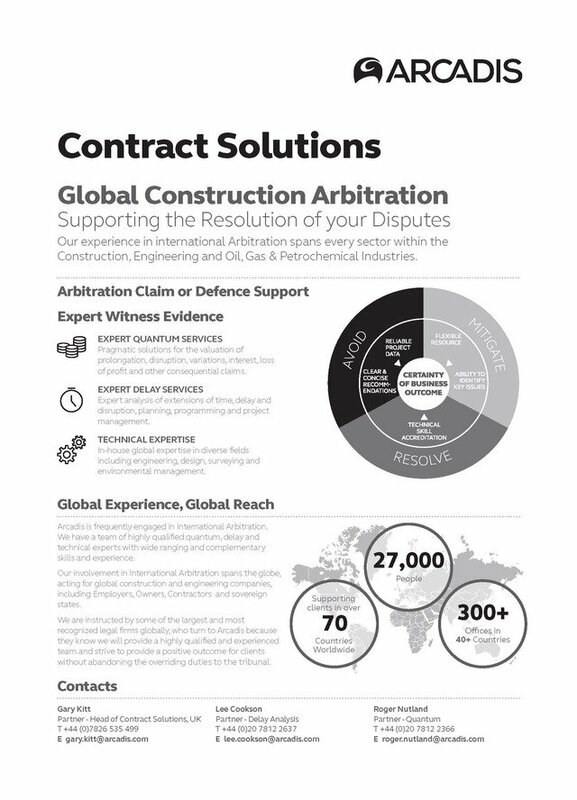 We have experience of acting for Employers, Owners, Sovereign States and global construction and engineering companies, and we have been instructed by some of the largest and most recognized legal firms. People turn to Arcadis because they know we will provide a highly qualified and experienced team and strive to provide a positive outcome for clients without abandoning our independence, impartiality or overriding duties to the tribunal.